The ocean front Vancouver Island real estate development of Silver Spray in Sooke offers both waterfront and view lots for sale. Phase IV lots are now selling at Silver Spray, with residential lot prices starting at $189,000. Phases I and II are sold out. The entire Silver Spray development has been carefully envisioned to include: 127 private residential lots with a broad array of sizes, views and prices; protected designated beach areas; a linear park running north to south through the project; a sheltered marina at the entrance of the Sooke Harbour Basin, and a golf course and resort development. 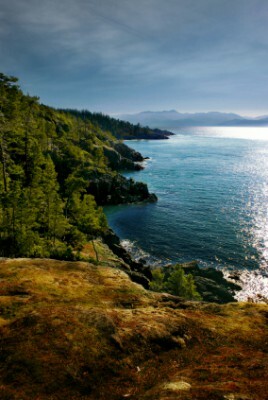 Silver Spray offers some of the best oceanfront properties for sale on Vancouver Island. In addition, Silver Falls Development Inc now has an offering focused on developing 35 Oceanfront Villas within a Private Residence Club. The Villas will be architecturally designed to maximize the front-row wilderness waterfront experience, and can be customized to include an assortment of features, including optional lock-off guest suites. For ultimate flexibility, villa suites may be separately titled for resale or rental purposes. Located close to the city of Victoria, Silver Spray offers privacy at the end of a country road, and access to the amenities in the nearby communities of Colwood, Langford, Metchosin and Sooke.